At night, a ‘blackout’ was ordered to make it harder for German bombers to locate cities and town from the air. All streetlights were switched off and car drivers were forbidden to use headlights. 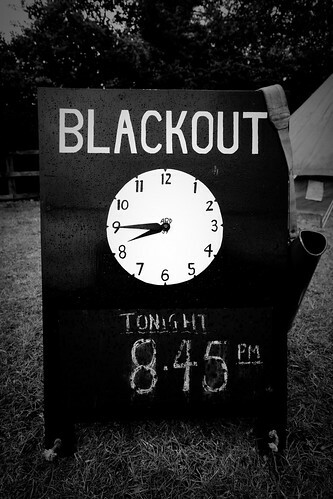 Families used thick black curtains, cardboard or special black-out paint to stop any light shining from their homes. In case of bombing, windows were taped up to stop flying glass flying about and hurting people. Air Raid Precaution (ARP) wardens were responsible for checking the regulations were adhered to and reported any offenders to the authorities. Lots of people were injured during the blackout: tripping up, falling down steps or bumping into things. Many also died in road accidents as drivers and pedestrians struggled to see each other. Pretend airfields were also built, complete with wooden models of planes, to try and confuse any Germans flying in the dark.